The aluminum "Moonstar" - GPM Racing Products edition was made by the German yo-yo maker Came-Yo (Harry Baier at the helm) around 1998. You could optionally install a set of included rubber rings on the outer perimeter of each halve (shown uninstalled in the package). The outer perimeter rings added about a gram of extra weight. 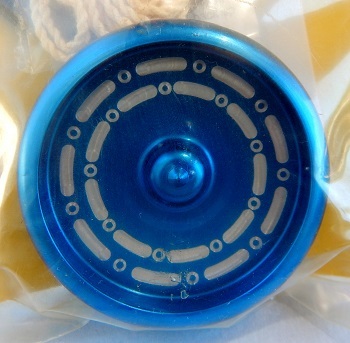 They also served protect the finish of the aluminum and cushion the impact of the yo-yo when it returned to your hand. Unlike the original Moonstar, this version did not come with rubber weight rings that you could install on the inside perimeter of each halve. Uses a size E ball bearing axle. No response pads, same as early Custom Yo-Yo models.